Slacken from the stress that usually tourists have and enjoy our garden. Simply ask to bring you in the hands freshly harvested oranges, or rest plainly in the hammocks, in the pool or in the lower-case massage cabinets. Meanwhile your children amuse themselves in the children cabinet or in the playground. You will find excellent amusement in the audit – and games – corner, for you and your family. In the evening allow yourself a friendly atmosphere in our tavern, or a glass of house wine and a nice conversation by the pool bar. 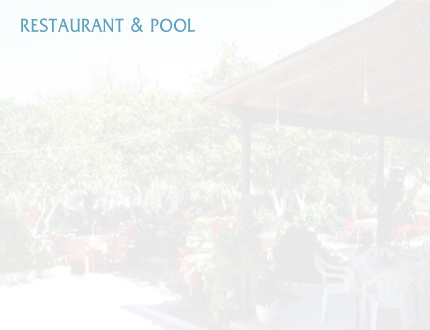 Spoil yourself with the original Greek and Corfiot gastronomic delicacies that are prepared with care and affection. For the half pension (3 Course Menu) we offer to you with much effort a variety of home-made food like fresh fish that we daily catch in our coast. Also the vegetarians and those who suffer from allergies have no chance of not being satisfied.